Gal Meets Glam Collection dot-textured dress with self-tie shoulder detail. Approx. length: 48"L from shoulder to hem; 38"L down center back. V neckline; buttons at front. Sleeveless. Blouson bodice. A-line silhouette. Midi length hem. Hidden back zip. Polyester. Imported. From the perfect espadrille to your new favorite dress, we have rounded up the must-have items to hit this Memorial Day Weekend in style. Whether you're staying local and heading to a BBQ or heading straight to the beach, we've got you covered. I looked at photos of Goldie Hawn over the years and noticed that one of her signature looks is bare shoulders. The “cold-shoulder” look has been embraced by women of all ages and figure types for decades. There's no need to throw away your favorite off-the-shoulder shirt or dress. Style it in a new way with these fresh ideas, here. 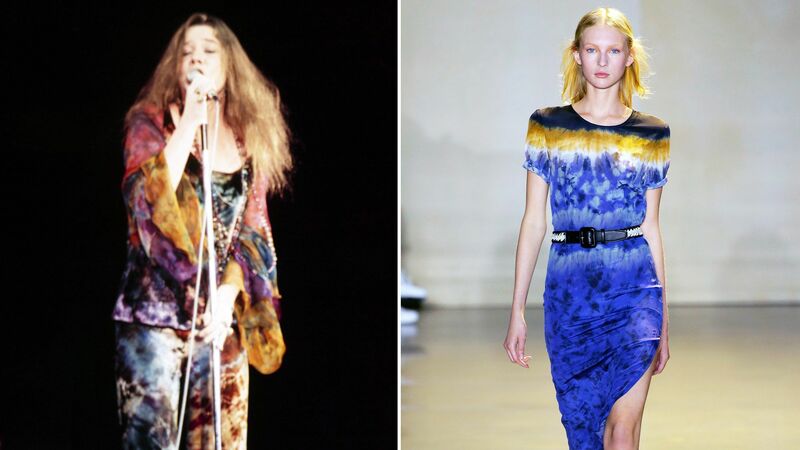 From '70s tie-dye to Spanish dresses, see all the classics that designers reinvented for the spring.